The German cities of Rostock and Chemnitz saw thousands march peacefully in mass protests against Chancellor Angela Merkel’s mass immigration policy over the weekend. 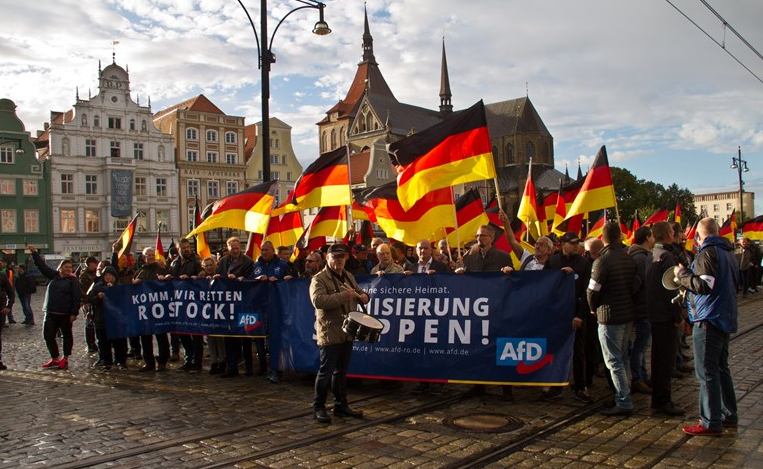 They were met by counter-protesters in Rostock but all remained quiet in the end. Ever since the spontaneous protests erupted in Chemnitz end of August after refugees killed a German during a city fair, the eastern cities have seen thousands march against the government’s open border policy which has let in many immigrants mainly from the middle east. Whereas on a national level the anti-immigrant AfD has overtaken the ruling socialists and became the second biggest party in the polls, in eastern Germany, they have even more support than in the richer west. It is, therefore, no wonder that cities like Chemnitz and Dresden can easily get thousands of people to march for the AfD. Germany has a regional vote on 14 October in its rich Bavaria region which will be seen as a test for Ms. Merkel’s coalition government. Her own Interior Minister Mr. Ernst Seehofer has repeatedly asked her to take a tougher stance on immigration as the CDU/CSU conservative party sees their own polling numbers drop even lower. Related coverage: <a href=" http://thegoldwater.com/news/37825-Germany-Elections-Government-Furious-As-Police-Allows-Neo-Nazi-Rallies-In-Dortmund-Video "> Germany Elections – Government Furious As Police Allows Neo-Nazi Rallies In Dortmund (Video)</a>. Should Ms. Merkel want to form a government now, she would need to make a coalition of at least 3 parties in order to stay in power. If Merkel can only be swayed by changes in the political winds regarding murders of her own citizens by the Muslim Hordes she compelled those same citizens to abide, she cannot be trusted by her citizens again, ever. The Volk need to knock the Polzei on their asses, go after that rat Merkel, then run the muslims out or under.